When a community gets access to clean water, it can change just about everything.It can improve health, increase access to food, grow local economies, and help kids spend more time in school. Here at Zandi K Salons, we believe that clean water is a human right and we are helping fight to get clean water for everyone, everywhere. 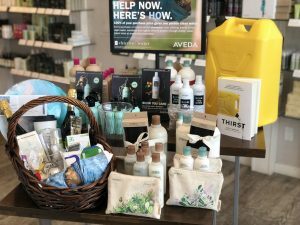 We are lucky to partner with local Colorado Earth conservation advocates, Western Resource Advocates for Earth month along with our Aveda Global partner, Charity Water. Western Resource Advocates (WRA) work tirelessly to protect the West’s land, air, and water to ensure that vibrant communities exist in balance with nature. 100% of money raised at Zandi K Salons goes directly to WRA, specifically to help protect and repair our water system right here in our back yards! Sadly, population growth is shrinking limited water supplies and threatening to dry up our rivers and lakes. Climate change is increasing wildfires, drought, heat waves and jeopardizing diverse habitat and wildlife throughout the state, and energy development creates pressure and tradeoffs on our public and private lands causing concern for our air and water quality, wildlife habitat and public health! WRA is a leader in protecting Colorado’s air, land and water. Their work to promote healthy rivers, with a focus on the Colorado River, protects numerous rivers and champions a sustainable water future for communities, wildlife, and agriculture. They work to advance clean energy through a robust cutting edge program promoting renewable energy, and reducing carbon emissions by closing coal fired power plants in the state. Their work on Western Land Conservation seeks to protect our communities and wildlife from oil and gas development – shaping regulations and laws for a responsible development. They are devoted to safeguarding the Colorado’s air, land and water for future generations to enjoy which is why we are so thankful to call them our Earth Month Partners! This year, we are taking the pledge to Stand Up for clean water! There are so many ways to help us win our fight for clean water, check below to see how you can help us reach our goal of $8,000! 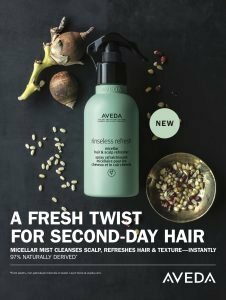 You can save approximately 6 gallons of water just by cutting 3 minutes from your shower with Aveda’s Rinseless Refresh, so take the pledge to go dry for as many days as you can this Earth Month! Rinseless Refresh is now available for purchase at both locations! 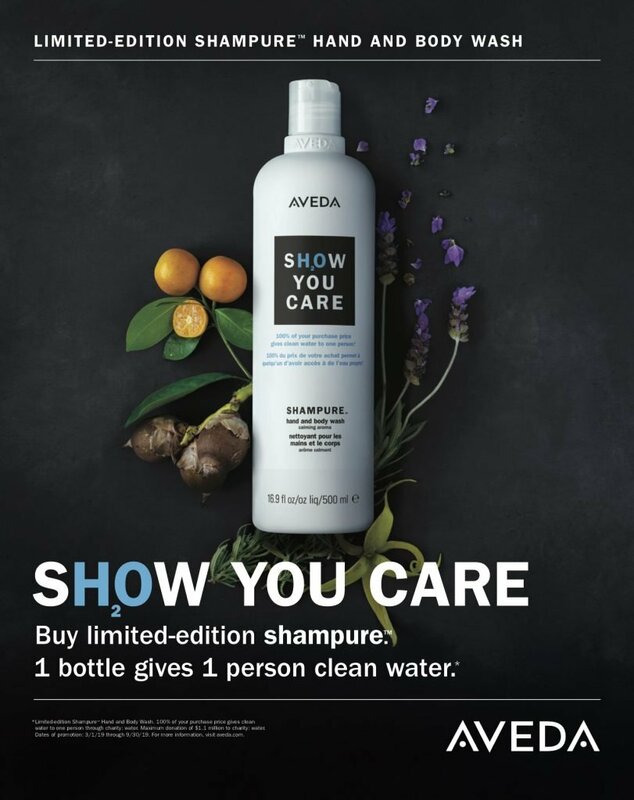 Aveda’s limited edition Show You Care hand and body wash with Shampure Scent is this year’s Earth Month Featured product!Gently cleanse your skin with this sulfate-free babassu nut-derived cleanser while calming the senses with an aroma containing 25 pure flower and plant essences, including certified organic lavender and ylang ylang. 100 % of the price of this hand and body wash is donated to help us reach our Earth Month goal and provides clean water for one person. At Zandi K Salons, we’re raffling off two amazing baskets, valued up to $700 each! These basket contain local brewery gift cards, CBD products, ZK Champagne, gourmet chocolates, free workout classes at Fierce 45, personal training sessions, Zandi K products, and more! You can purchase one raffle ticket for $5 or 5 raffle tickets for $20. 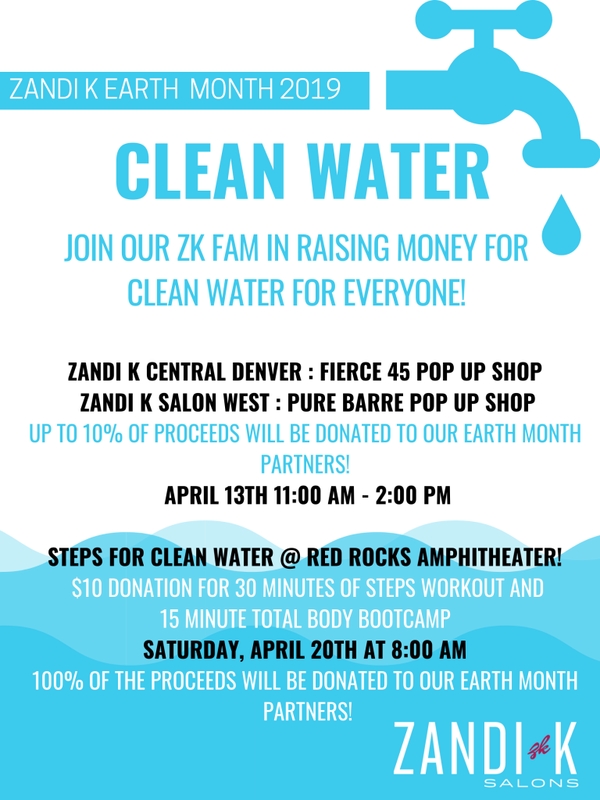 Check out all of the amazing Zandi K Events happening during the month of April to help raise money for our Earth Month Partners! At our Central Denver location we are hosting Fierce45 from 11:00 AM – 2:00 PM on Saturday, April 13th. Fierce45 is coming equipped with some discounted memberships and some of their amazing athleisure, too! Brands from ALO to Free People, they have it all. Fierce45 is donating 2% of their proceeds to our Earth Month Fundraising goal for Western Resource Advocates! At our Denver West location we are hosting Pure Barre Belmar from 2:00 PM – 4:00 PM on Saturday, April 13th. They’re bringing some amazing athleisure that will definitely have you sweating in style and Pure Barre Littleton is donating 10% of their proceeds to our Earth Month Fundraising goal for Western Resource Advocates! April 20th! Register for only $10 here! A $10 donation gets you 30 minutes of sweat on the steps plus a 15 minute total body HIIT circuit. Join our fam for this fun workout and help raise money for our Earth Month Partners; Western Resource Advocates and Charity Water. Have your athletic wear and water ready and meet at the bottom of the stairs, center stage! Can’t wait to see you there! No matter how you choose to donate, our Zandi K Family wants to thank you from the bottom of our hearts for taking the pledge with us to stand up for clean water!